Double layers stretch film machine uses LLDPE as main material and adopts several kinds of resins to manufacture the single/double-side self-sticky stretch wrapping film. 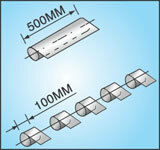 The stretch film has good tensile strength,anti-pricking ability and impact strength. Its good shrinking memory function and self-sticky can make goods integrity to prevent goods from loosening and collapsing during transportation and being polluted by dust. The transparency and tensile strength of this product can make the packaging beautiful, economical and practical. 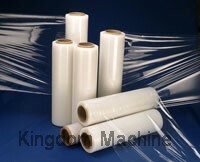 The film can be widely used in wrapping of palletized goods. 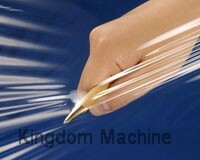 Its a good substitute for hot shrinking packaging film during transportation.